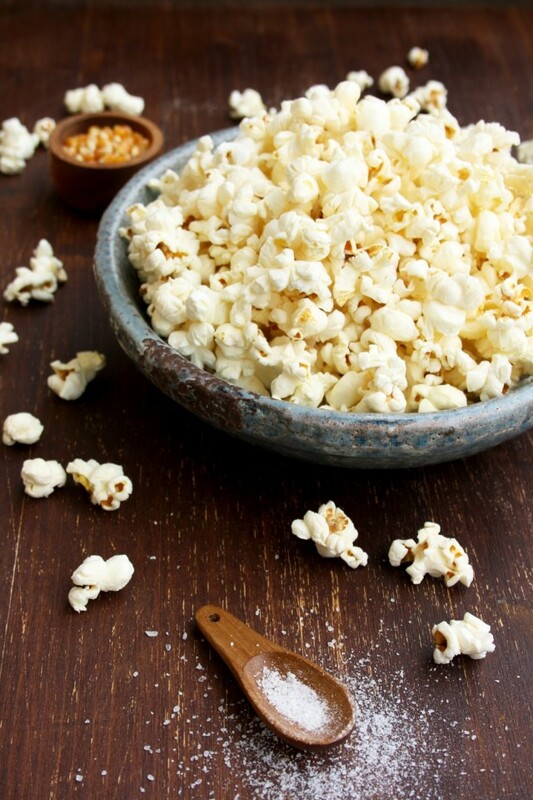 Stovetop popcorn makes for a great healthy snack ready within minutes! 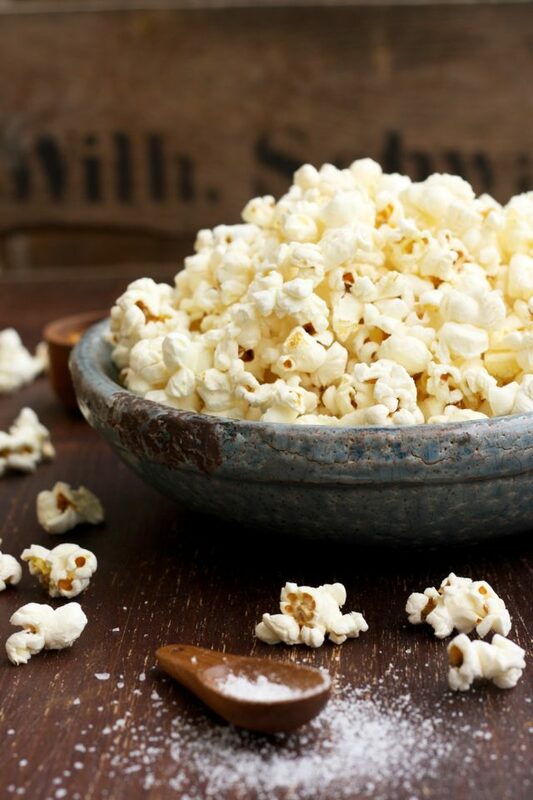 With this easy recipe your stovetop popcorn will always come out perfectly popped! The idea to make stovetop popcorn didn’t really come into my mind up until recently. If I made popcorn before, it was usually flavored microwave popcorn. I’m really happy that now I can make really easy stovetop popcorn from scratch within minutes! I just didn’t know how easy it is. It’s also quick, delicious and cheap. The method I used works every time on the stoptop or on the grill. Actually, the first time I made it was on the grill and it was really cool! This day was a real corn paradise: my favorite grilled corn on the cob with creamy avocado dill dressing and homemade honey mustard popcorn. Using grill to pop popcorn was my husband’s idea and it couldn’t be more fun! 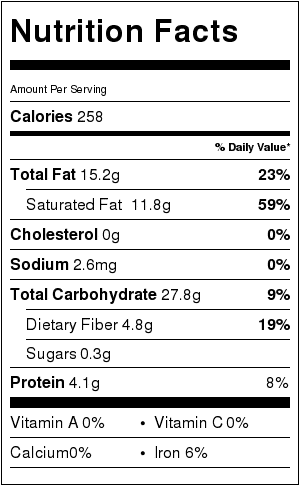 To be honest, I always thought that popcorn is an unhealthy snack. However, it only refers to prepacked popcorn with tons of additives like unhealthy oils, salt and sugar. 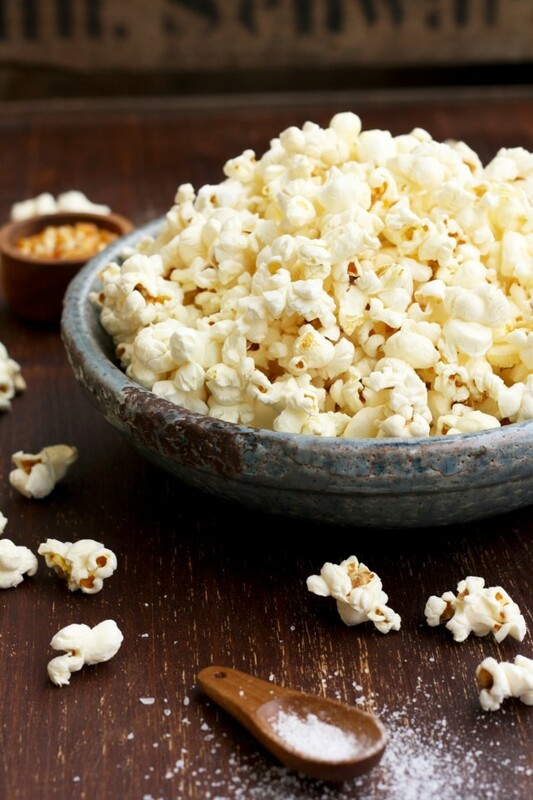 When you make your own stovetop popcorn, you can control the ingredients you put in it. 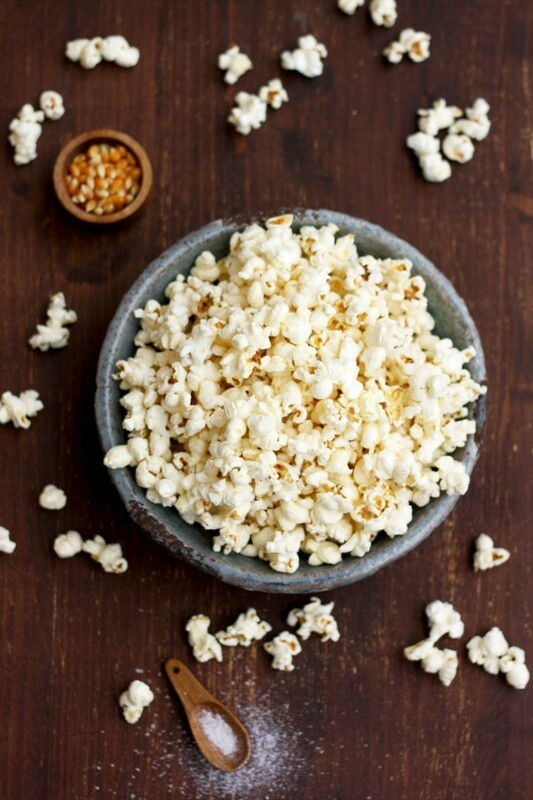 Plain popcorn is a great source of fiber, antioxidants, polyphenolic compounds, vitamin B complex, magnesium, manganese and whole grains while being low fat and super easy to make! 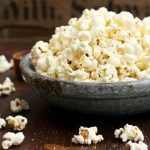 Homemade popcorn reduces your cholesterol level, improves digestion and metabolism, aids in weight loss, regulates blood sugar, contains anti-aging agents and might even prevent cancer. 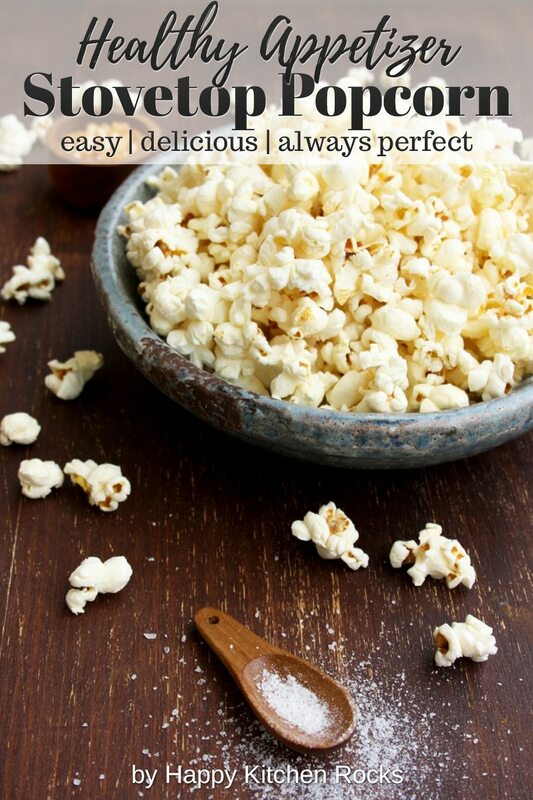 Popcorn keeps you healthy and happy, so there is absolutely no reason not to make it for your next movie night at home! 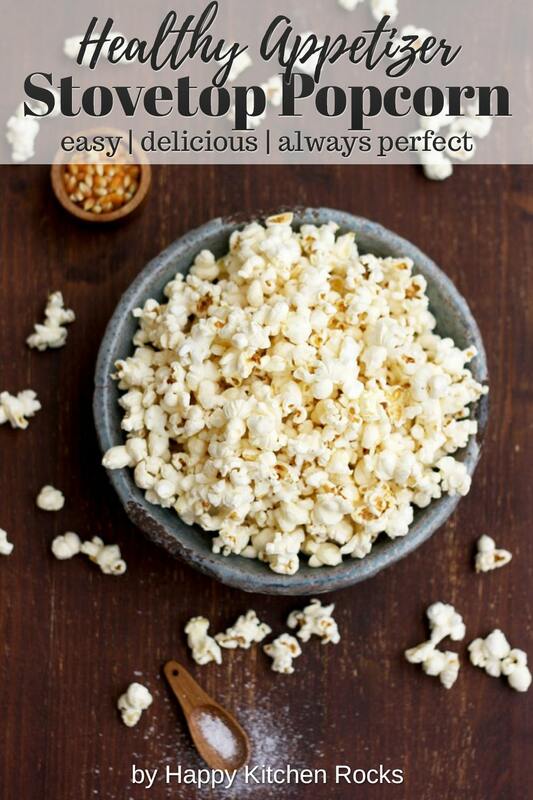 Here are some more health benefits of popcorn that will convince you to make it, if you aren’t convinced yet. I could go on and on but I had to stop at some point. 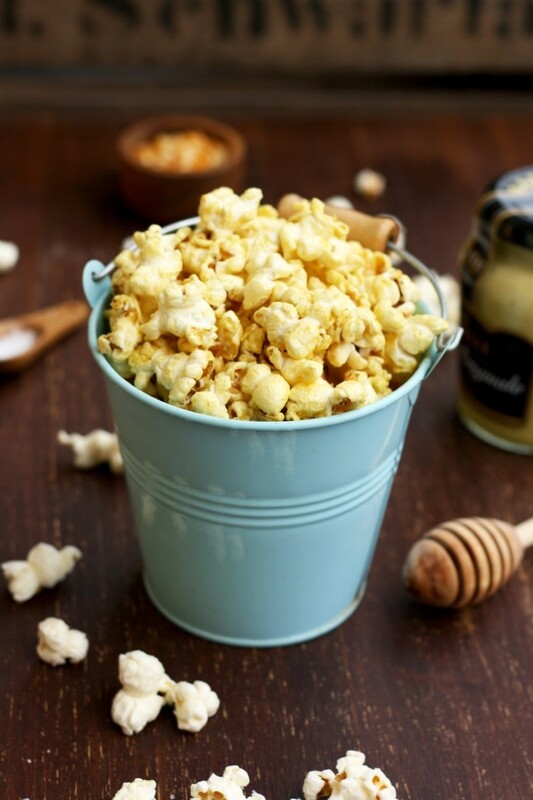 I mean, can you resist a handful of crunchy and fluffy honey mustard popcorn that is ready within minutes? I can’t. It smells and tastes amazing! The best thing is that it’s really easy to make and here is how to do it. With this recipe you can be sure your popcorn will pop perfectly every time, with nearly no kernels left unpopped. It allows most of the kernels to pop simultaneously, so it never burns. Start by heating coconut oil (or any other oil that has a high smoke point: peanut, canola, etc) in a large thick-bottomed pot or saucepan over medium-high heat. Add salt (if using). Drop 3 popcorn kernels into the pot and wait until they pop. Add the rest of the kernels, cover and remove from the heat for 30 seconds. Return to the stove and gently shake once the kernels start to pop. Keep the lid ajar to let the steam out and make the popcorn more crunchy. Once the popping slows down, remove from the heat and let the last kernels to pop. Transfer to a bowl and add your favorite flavorings (or eat it as it is, it’s delicious!). I used honey mustard seasoning. If you like his pairing, I’m sure you will enjoy the popcorn flavored with it. For the amount of kernels stated, you’d need to combine 1 tablespoon of honey, 1 tablespoon of Dijon mustard, a bit of salt and black pepper to taste. Pour the sauce over the cooked popcorn and mix well to combine. Heating coconut oil (or any other oil that has a high smoke point: peanut, canola, etc) in a large thick-bottomed pot or saucepan over medium-high heat. Add salt (if using). Transfer to a bowl and add your favorite flavorings (or eat it as it is, it's delicious!). To make the honey mustard seasoning, combine honey, Dijon mustard, a bit of salt and black pepper. Pour it over the cooked popcorn and mix well to combine. Enjoy!